How Do Our Hands Help Us Explore and Understand the World? I must admit that until recently I had taken my hands for granted. I began to realize their importance as I worked with students on a self-portrait project inspired by Wendy Ewald’s The Best Part of Me: Children Talk About Their Bodies in Pictures and in Words. Through the portrait making process, I have grown to understand and appreciate how deeply our hands connect us to each other and to everything around us. When I asked the group of ten and eleven-year-olds to create photo portraits of their hands as a way to express their individuality, I discovered a little bit about how their hands help them meet the world—and they learned a lot about themselves as they explored how they create, play, and make connections through their hands. We began the project with a simple activity to get us thinking about our hands and how they are helpful. The students traced outlines of their hands in which they brainstormed all the reasons why their hands are important to them. 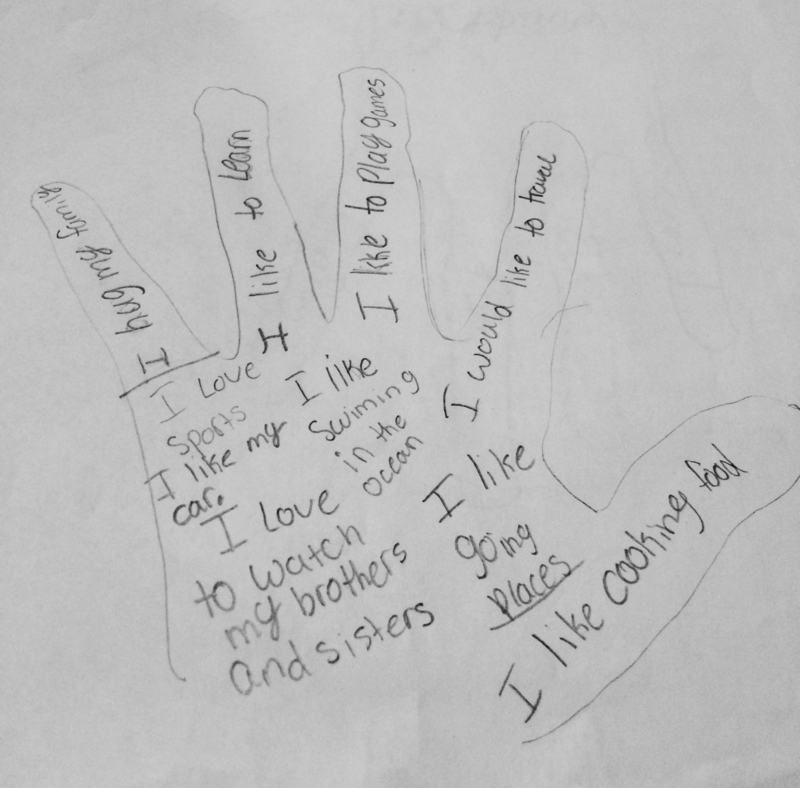 Students listed their hobbies such as sports and drawing along with ways they use their hands to care for pets and help parents with chores. 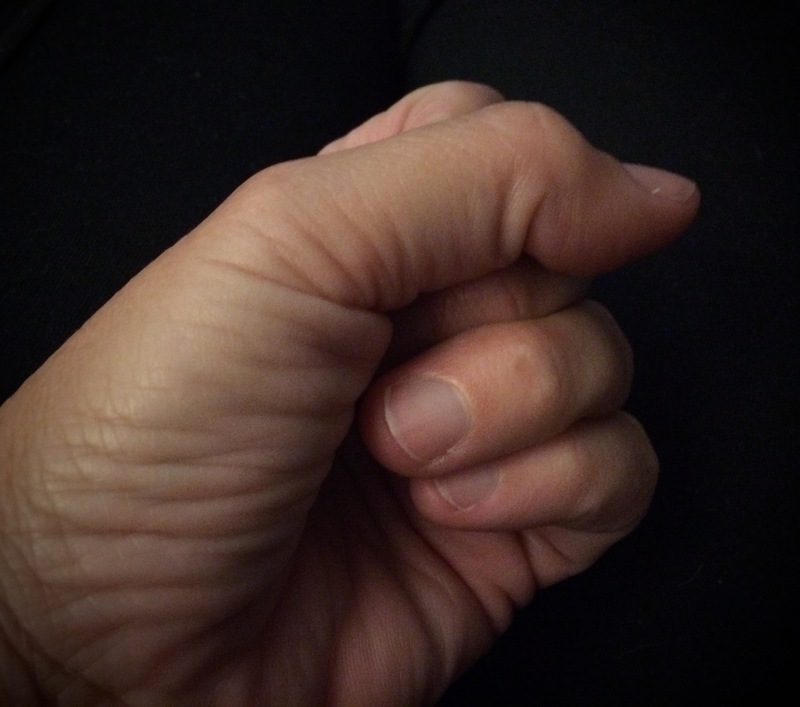 I then introduced the idea self-expression through self-portrait by sharing several photos I had taken of my own hand. Through each image, I attempted to show a different emotion, such as anger, calm, excitement, and openness. The students and I discussed the photographs as we analyzed what each was expressing. After we talked about all the ways our hands could be used to express an idea or emotion, I explained the variety of options they had for photographing their hands. When they got to work, most partnered up because they quickly discovered that it is almost impossible to take a photo of one’s own hand with an iPad. The students were encouraged to explore and be creative as they considered composition, including background, perspective, and lighting. The expressive portraits they created astonished me. 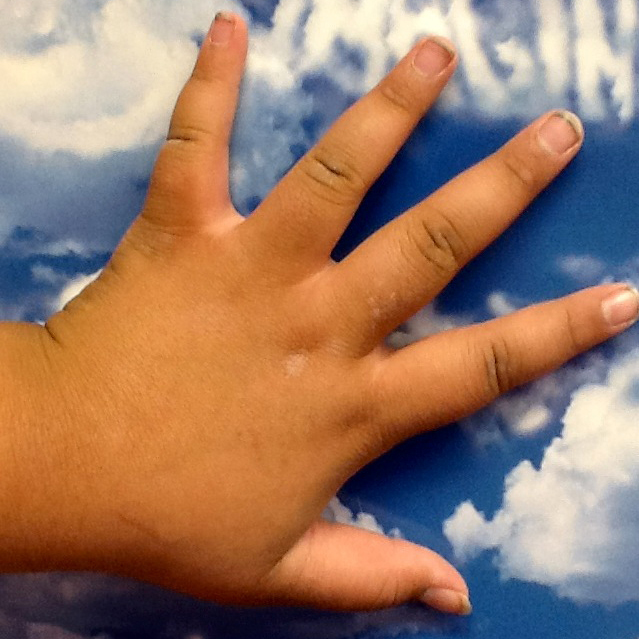 One student placed her hand against a poster of the clouds with the word imagine, and another choose to take a photo of her hand as she reached toward a flower. Several of the boys decided to focus on sports while one made a peace sign symbol in front of a map of the United States. He said he wanted to express his desire for world peace. After the students had the opportunity to make several images, we turned our efforts to writing about our hands. After looking everywhere for a poem that could be used as a mentor text, I was inspired to write my own. My hands are precious and creative. They are lined but they are strong. They help me tell my story. My hands labor in the garden. They pack the earth tight around a sculptural succulent. They pick colorful flowers and pull insidious weeds. My hands work hard in the kitchen. They season sauces and savory delights. They make delicious meals for my friends and family to enjoy. They draw portraits and paint mountain landscapes. They create fantastical pictures that only I can imagine. As we studied the poem, the students pointed out the repetition and patterns they observed. They were then able to apply what they noticed to their own writing. The students wrote drafts that they typed in Pages before adding images to their documents. Their products were well done (see sample My Hands), but we decided to go one step further by creating multi-media digital projects. I discovered an app called Shadow Puppet, which allowed students to quickly and easily create narrated slide shows using multiple images. Some were nervous about using the app to read and record their poems, but with practice, they were able to master the app and their fears. Our final event was a film festival of sorts. We watched the videos and responded to each other with positive feedback. Sharing was the most difficult part for many of the students. A few were embarrassed to open themselves up in such personal ways. In their reflections, the students who expressed concerns about sharing also expressed that they were proud of themselves for overcoming their shyness and allowing others to view their creative and personal works. You too can get to know a few of these special fifth grade students by watching their amazing multi-media presentations posted below. They might even inspire you to get to know yourself a little better by reflecting on all the reasons why your hands are important to you. This entry was posted in Creating, Education, Photography, Teaching, Uncategorized, Writing and tagged #teaching, #write2connect, #writing, Education, sdawp, sdawpdw. Bookmark the permalink. 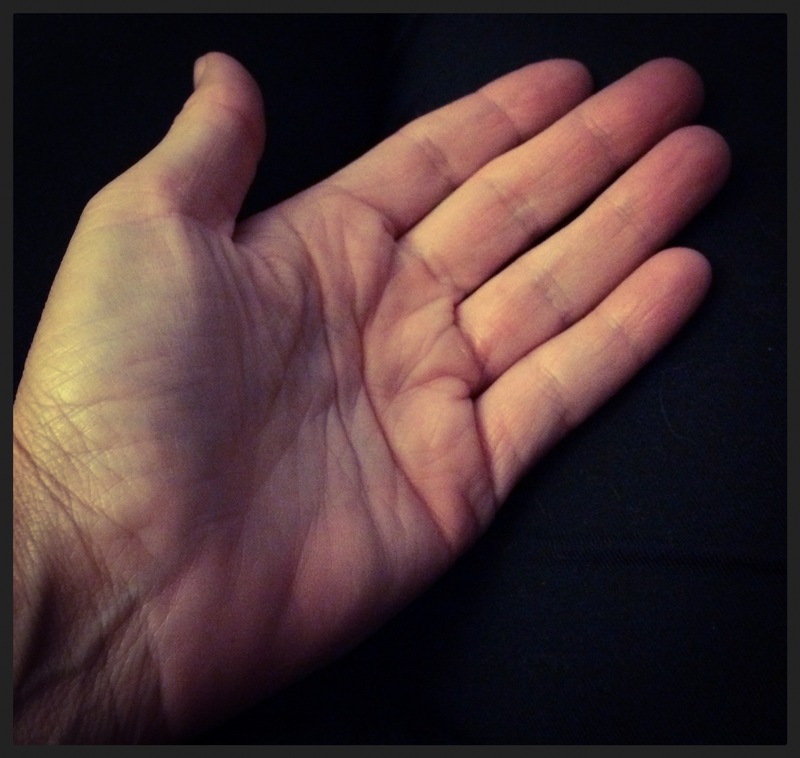 6 Responses to How Do Our Hands Help Us Explore and Understand the World? Janis, I’m so glad you wrote this up and posted so we can all appreciate the wonderful work! I’m thinking that there is a great picture book about hands…I’ll have to look and see if I can find it! Might be another mentor text! Thanks, Kim. A picture book about hands would have been a perfect mentor text for this project. I looked but didn’t have any luck. Let me know what you find. Janis, as a FCS teacher who teaches the practical use of hands I found this a very uplifting post. I just came out of a frustrating marking period with middle school students very down on their abilities. I think I will start off with my new students creating a self portrait of their hands and all they CAN DO then post in the room for daily reminders. Thanks for the share. Sue, I am thrilled that you plan to start the new semester this way. I love the idea of emphasizing what students can do. I did not make that point explicitly when we were creating our hand portraits, but I certainly will next time. Please share your student work when they have completed their portraits. I can’t wait to share … I love to share my student work, and they get a kick out of other people seeing what they do. What a wonderful project for your students. Your own poem was definitely used as a mentor text by many of your students. Loved hearing the voices and just seeing the hands!